1. H-Frames: Each H frames of 2 meters Height with spigot made-up of 50 mm Dia Aluminium Alloy round pipes are connected with ‘T’ joints fully Aluminium welded. For maximum strength and durability. 2. Brasses Horizontal Diagonal: Self-auto locking snap braces spring loaded horizontally and diagonally fully Aluminium welded for maximum strength and durability. 3. Working Platform: Working platform made up of Aluminium Alloy rectangular sections fitted with side claws hook, lifting ring and trap door systems. fitted with the Aluminium chequered plate (sheet)fully welded. It can place at any required height. 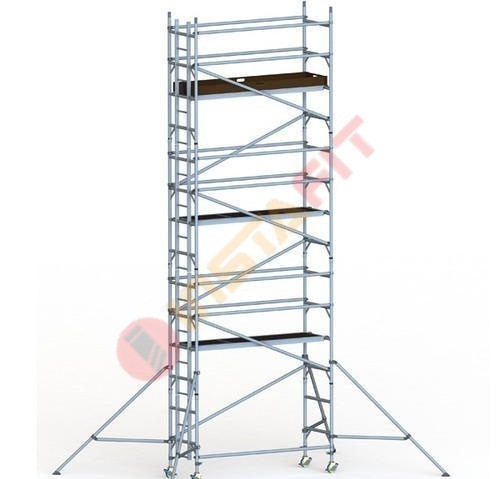 4.Adjustable Outrigger: Adjustable outrigger (stabilizers) Spring loaded with handle adjustment can be connected to the structure of free-standing scaffolding towers fitted with clamps and rubber bungs. 5. Castor Wheel's: Breakable castor wheels heavy duty with a load rating of 900 Kgs. With 12 inches adjustment for even areas like steps, staircase, and sloping rungs. 6. Staircase Ladder: Internal staircase ladder with flat non-slip corrugated steps fitted with clamps and adjustable winged for easy access.